Senator representing Akwa Ibom North West Senatorial District, Senator Godswill Akpabio has resigned as the Minority Leader of the 8th Senate of the Federal Republic of Nigeria. In a resignation letter addressed to the Deputy Minority Leader, Senator Emmanuel Bwacha, Senator Akpabio said his resignation was with effect from August 4, 2018. Senator Akpabio thanked the Senate leadership, the minority leadership, all distinguished Senators, his party the Peoples Democratic Party (PDP) for the opportunity to lead the PDP Caucus in the last three years. Senator Akpabio is expected to be received into the All Progressives Congress (APC) at a rally in Ikot Ekpene, Akwa Ibom State on Wednesday, August 8, 2018. Meanwhile, the Senate caucus of Peoples Democratic Party, PDP, has begun moves to replace Minority Leader of the Senate, Senator Godswill Akpabio (Akwa Ibom North-West) and regretted not getting rid of him earlier. A source said PDP has already commenced plans to replace the Minority Leader once he steps out to his new party. According to the senators, fear of overheating the polity and causing crisis in the PDP made them not to remove him as Minority Leader when they discovered that his commitment started waning. The senators said they would get over the disappointment and appoint a very vibrant replacement who would lead the business of the party in the Senate successfully. Meanwhile, a senator from Akpabio’s state said he was still a member of the PDP, noting he would not leave the party. The senator, who spoke on condition of anonymity, said: “Some months ago, it came to the knowledge of the Senate PDP caucus that the Minority Leader was having some challenges with leading the members. Another senator said: “We got to know late that he was no longer one of us. We had thought of removing him as Minority Leader since last year and ostracise him from serious plans but two senators prevailed on us and pleaded that he would change. “All along, we suspected that he was having contacts with the ruling party. Twice, it was reported that he visited the Presidential Villa and he never denied it. A number of our members were worried, what would a Minority Leader be doing in the Villa without the Senate President or other principal officers. “For instance, apart from keeping away from all the campaigns on the governorship of our candidate in Ekiti State, he was actually linked with working closely with the ruling APC on the matter of that election. “Even as tight as we thought we had kept our plans on the defection of 14 APC senators on July 24, the ruling party and the Presidency were briefed on every step and our members were worried. Another senator, however, lamented, saying: “He (Akpabio) was more interested in calling caucus meetings of the party in Senate than attend plenary because strategies of the party are always discussed at the caucus meetings. Another ranking senator said the lawmakers were aware of the “juicy promises” being dangled at Akpabio, adding that moves had been made to reach some of them. Akpabio’s move to defect from PDP on whose platform he served two terms as governor of the state and handed over to his hand-chosen successor, Mr. Udom Emmanuel, however, appeared to lose traction, yesterday, after all members of the state House of Assembly pledged loyalty to the governor. Meanwhile, expectations of a possible reconciliation between Akpabio and Emmanuel were dashed, yesterday, as the former governor continued with moves towards the planned defection. A meeting scheduled to hold between both men brokered by a mutual associate of the two men fell through following Akpabio’s dash at the weekend to London where he met with the vacationing President Muhammadu Buhari. The Senate Minority Leader on returning to Nigeria yesterday, met with the APC national leader, Asiwaju Bola Tinubu, at the latter’s Asokoro, Abuja residence. Vanguard gathered that Tinubu played a key role in bringing Akpabio over to the APC. At the meeting between both men, Akpabio was quoted as saying “this was where it all started and I have now come for final consultation ahead of defection,” a source privy to the discussion said. Meanwhile, mixed reactions continued to greet the planned move by Akpabio with APC chieftains expressing readiness to welcome the former governor of the state. Many PDP associates of the former governor were, however, unconvinced as at yesterday. Among those to have formally renounced Akpabio’s move was the Speaker of the State House of Assembly, Mr. Onofiok Luke, who in a terse statement, yesterday, said he is a principled person who likes to remain consistent. 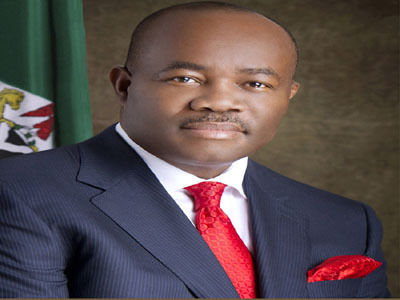 Debunking insinuations of his resignation from office in sympathy with Akpabio, yesterday, the deputy governor in a statement by his Chief Press Secretary, Ekikere Umoh, said there was no modicum of truth in the reports. Speaker of the state House of Assembly, Mr. Luke, vowing not to follow Akpabio in a statement yesterday, said: ‘’I am a full-blooded member of the PDP. I am a principled person, and I like being known for consistency.” He dismissed speculation in some quarters that he would soon defect to APC. The Speaker noted that he started his political career in PDP and would remain in the party to prosecute his political ambition. Meanwhile, former National Publicity Secretary of the PDP, Chief Olisa Metuh, yesterday, urged PDP members to refrain from harshly criticising Akapbio as he called on members to pray for him. In a statement posted on his Facebook wall, Metuh said: “If this rumour is true, I cannot guess his reasons. Many have claimed it has to do with threats of …. “Yes, it is a lonely road when you are visited with state-sponsored media trial, your family name and reputation tarnished with falsehood. It is a lonely road when some of those you hoped will defend, console and support you are frightened even to assist in any manner whatsoever. However, caucus leader of the APC in Akwa Ibom State, Chief Don Etiebet, yesterday, said the defection of Akpabio is still a rumour until he personally confirms he has truly decamped.